At Marriner, it’s safe to say that in our 200 plus years of selling yarn, we’ve almost ‘seen it all’. We say ‘almost’ as this week we’ve seen an unprecedented demand for our yarns, in particular our Marriner Mermaid Double Knit 100g. 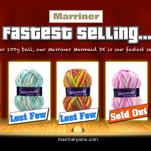 Sales of Marriner Mermaid have been so rapid, at the time of writing, we’ve now sold out of our Carnival, Pink and Blue Mermaid colours with the just a limited amount of Marriner Sunshine and Pebble remaining on our warehouse shelves. It’s fair to say that our customer’s purchasing of this double knit yarn has been ‘viral’. Indeed, we’ve heard directly from our knitting community on our Facebook Page, that they’ve been sharing links to our yarns with their respective knitting groups which has led to this surge in demand. In order to meet our customers’s unprecedented demand, we’ve commissioned a complete replenishment of our Marriner Mermaid range. We’re pleased to say that this DK yarn will be online and ready for purchase by July of this year. We’ll also be welcoming back an old favourite from the Marriner back catalogue as well as unveiling a brand new Marriner yarn – you heard it here first. Everyone at Marriner thanks our loyal customers, both old and new, for their continued support of our knitting yarns. Without our customers’s support we couldn’t have kept ‘Britain knitting since 1784’. If you’d like to stay up-to-date with all things Marriner why not Like us on Facebook or follow us on Pinterest and Twitter. We love to stay in touch with our knitting community.